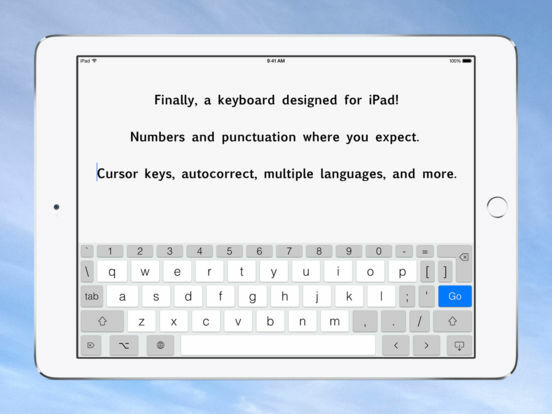 iPad typing without tears! When it comes to on-screen keyboards, bigger IS different, and PadKeys is built to take advantage of the large tablet screen size. Stay with the flow when it’s time to type a number or symbol or you need to move around, because the needed keys are right there in the main layout. And we use the full width, not just the middle, to display word suggestions. Ergonomics aren’t sacrificed either. The main keys are big enough to type fast, and autocorrect is fine-tuned for catching common finger misses. You’ll find using PadKeys is almost like having a full bluetooth keyboard — without the weight and bulk! • Numbers and punctuation in one layout, where your fingers remember. • Cursor keys for easy, precise movement by letter or word. 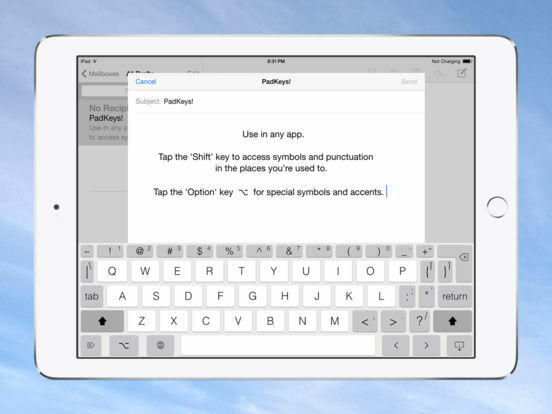 • Option layout for typing symbols and accented characters. • Full autocorrect in all supported languages, showing more than three words. • "Short" layout for more screen visibility in landscape orientation. • Fixed font problem in OneNote. • Added link in instructions to tutorial videos. – NOTE: If you are running iOS 10.0 we highly recommend upgrading to 10.1 for a better experience with all third-party keyboards. © 2016 Natural Designs Software, Inc.